Born on February 7, 1973, David Pipe is the son of 15-times champion jump trainer Martin Pipe. He took over the reins at Pond House in Somerset following the retirement of his father on the last day of the 2005/2006 jump season - Saturday, April 29. The 33-year-old made the best possible start to his training career under rules when getting on the scoresheet with his first runner, Standin Obligation, in a three mile and one furlong novice chase at Kelso on May 9, 2006. Our Vic landed the Grade Two bet 365 Charlie Hall Chase at Wetherby in October on his seasonal return to provide David with his biggest win to date. David will be hoping to match the phenomenal achievements of his father, who totally revolutionised jump racing in Britain with his new approach to training racehorses. Martin Pipe came to dominate the sport, having started his training career in 1977, re-writing the record books with his incredible tally of winners. He sent out 230 winners during the 1990/91 season, only to break that total when landing 243 successes in the 1999-2000 campaign. Along with his 15 trainers championships, Martin Pipe also saddled 34 winners at the Cheltenham Festival over the years, taking the Champion Hurdle twice with Granville Again (1993) and Make A Stand (1997). He won the Grand National with Miinnehoma in 1994, took the Welsh National on five occasions and landed the Paddy Power Gold Cup an amazing eight times, with Beau Ranger (1987), Challenger Du Luc (1996), Cyfor Malta (1998 & 2002), Lady Cricket (2000), Shooting Light (2001), Celestial Gold (2004) and Our Vic (2005). David Pipe started out riding in point-to-points in 1992, going on to record 22 wins over the next five seasons, plus two under rules, which included victory aboard Bonanza Boy in the Ludlow Gold Cup. After finishing as a rider, he had spells with Michael Dickinson in the US, Criquette Head-Maarek in France and Joey Ramsden in South Africa, before setting up as a point-to-point trainer, handling the likes of Horus, Lord Atterbury and Celestial Gold, who went on to have successful careers under Rules when transferred to his father’s yard. Based at Purchas Farm, a mile away from his father’s Pond House, he sent out 164 point-to-point winners over six seasons, with Well Armed successful 15 times. Having acted in an assistant trainer capacity to his father for the past few seasons, David now has the chance to make his own mark in the training ranks. David has the support of leading owner David Johnson as he bids to bring the trainers’ title back to Pond House, following the success of West Country neighbour Paul Nicholls last season. So far this season, David Pipe has sent out 32 winners (up to Tuesday, November 7). Acambo, recruited from the Flat in Germany, made the best possible start to his hurdling career, winning on his debut in a maiden event at Taunton over two miles and a furlong in November 2005, and following up the next month over a furlong less in handicap company at Windsor. On his third start he finished third behind the high-class Straw Bear in a novice event at Leicester (Jan 06), and then ran fifth to the useful Crow Wood in a competitive handicap at Musselburgh (Feb 06), both over two miles. After finishing unplaced behind Desert Quest in the Grade Three Vincent O’Brien County Handicap Hurdle at The Festival in March, Acambo regained the winning thread with a fine success in the two-mile Grade Three Betfred Swinton Handicap Hurdle at Haydock on May 6, keeping on in game fashion to deny Irish challenger Callow Lake by a length and a half. He is entered in the £65,000 Greatwood Handicap Hurdle at Cheltenham on Saunday. David Pipe said: “He was Dad’s last winner and is in his 10 to follow. Acambo has summered well and filled out. “He is going well at home but is rated 136 after his win in the Swinton Hurdle at Haydock. It took Commercial Flyer six races to get off the mark over hurdles, capturing a two mile and one furlong handicap at Newton Abbott in March, 2005. However, once he had got his head in front, he ran up a sequence of five successive victories inside a month, culminating with victoryin a three mile and three furlong event at Perth on April 22, 2005. He was unable to land a sixth straight victory when fifth at Sandown a day later. Commercial Flyer was not seen again until the following February, when he embarked on a chasing career. He made a very impressive fencing debut at Taunton over an extended two miles and seven furlongs, beating Blue Business by an easy four lengths, having jumped immaculately throughout. On the back of that success, Commercial Flyer was pitched straight into Grade One company for his second chase outing, in the Royal & SunAlliance Chase at The Festival (March, 2006). However, he did not jump or travel with any fluency and was pulled up behind Star De Mohaison. He also failed to sparkle on his final outing the following month at Aintree, in the Grade Two John Smith’s Mildmay Novices’ Chase over three miles and a furlong, pulling up behind his Cheltenham conqueror, but he remains a horse of huge potential. Commercial Flyer has two entries at The Open, in the Paddy Power Gold Cup and the Servo Computer Services Handicap Chase, both on Saturday. David Pipe commented: “We have not decided yet whether he runs at The Open or not. He in the Paddy Power but would only go there if anything goes wrong with either Vodka Bleu or Tamarinbleu. David Pipe said: “Joaaci is very lightly raced and has some good form but last season did not go according to plan. He was brought down at Warwick and then fell at Haydock. Lough Derg made a promising start to his career when scoring by a distance on his debut in a juvenile novices’ hurdle at Newbury in November, 2003. He duly followed up at Warwick the following January, and, after two reversals, rounded off a good debut season with a six-length victory over Zimbabwe in a two mile, one furlong juvenile event at Cheltenham. The 2004/05 season saw Lough Derg win twice more at Cheltenham, firstly with an eight-length defeat of the well-regarded Exotic Dancer in the Relkeel Hurdle (December) over an extended two miles, five furlongs. He again ended his season on a high at Prestbury Park the following April when defying top-weight to defeat Unleash by two and a half lengths in a handicap over the same distance. Lough Derg returned to Cheltenham for his chasing debut at last year’s Open when he was a staying-on second to Crozan in the Jim Brown Memorial Novices’ Chase. A fall in a Grade Two event at Newbury was followed by success in an Exeter beginners’ chase over just short of three miles in December, but jumping errors surfaced on each of his next three starts, including when pulled up behind Star de Mohaison in the Grade One Royal & SunAlliance Chase at The Festival. Lough Derg returns to hurdles for his seasonal bow in the Listed Lombard Properties Handicap Hurdle over three miles, one and a half furlongs at Cheltenham on Saturday. David Pipe declared: ““The owner wants to run him over hurdles and he will either go for the very competitive Lombard Properties Handicap at Cheltenham on Saturday or wait for Ascot the following weekend. Unraced over hurdles, Prince Ary won on the Flat when trained by Barry Hills over 10 furlongs at Windsor in August and finished third over the same course and distance behind the useful Abhisheka on October 16 - his most recent outing. Rated 80 on the level, he looks a potentially smart recruit. He is entered in the Ryman The Stationer Juvenile Novices’ Hurdle at Cheltenham on Saturday. Standin Obligation is a very promising recruit to the chasing ranks, having landed both starts over fences in novice company with ease. A comfortable three-length victory on his fencing debut at Kelso in May, over three miles and a furlong, was followed by an 18-length romp at Wetherby over a furlong and a half less on June 1, jumping fluently on both occasions. A three-time point-to-point winner in Ireland, he ran up a sequence of five wins on the bounce over hurdles in 2005 after arriving at Martin Pipe’s stable, culminating in a length and a half success in the Lombard Properties Handicap Hurdle at Cheltenham, over three miles and one and a half furlongs (November, 05). He disappointed on his next two out outings, but returned to winning ways back at Cheltenham, with a comprehensive seven-length triumph over Rimsky under top-weight in a three-mile handicap hurdle in April. He is entered in the Steel Plate & Sections Novices’ Chase at Cheltenham on Friday. David Pipe said: “Standin Obligation was Dad’s last winner at Cheltenham and my first winner as a trainer so he will always have a special place in my heart. “All he has done is improve. He has won his two starts over fences and has been very impressive. Tamarinbleu scored first time out over hurdles in November, 2003 and went on to finish a respectable ninth behind Made In Japan in the 2004 Grade One JCB Triumph Hurdle at The Festival. He began the 2004/05 campaign with victory in the competitive Listed Ladbroke Handicap Hurdle at Sandown over an extended two miles, and went on to finish second over two and a half miles at Aintree and fourth to Rooster Booster over two miles and half a furlong at Sandown. Sent chasing last term, Tamarinbleu ran a cracker on his fencing debut when mugged on the line by Accordion Etoile in the two-mile Grade Two Independent Newspaper Novices’ Chase at Cheltenham in November, 2005. He landed a two-mile contest at Ludlow in January, beating Jacks Craic by an easy 14 lengths - an effort made to look even better by the runner-up’s subsequent victory in the Grade Three Red Rum Handicap Chase at Aintree - and rounded off last term with ninth place behind Voy Por Ustedes in the Grade One Irish Independent Arkle Challenge Trophy at The Festival in March. Tamarinbleu is entered in the Paddy Power Gold Cup at Cheltenham on Saturday. David Pipe remarked: “He goes for the Paddy Power Gold Cup. He has only won three races but runs well when fresh. Martin Pipe is putting £400 of a £500 charity bet provided by Paddy Power on Tamarinbleu, with a £100 reverse forecast with Vodka Bleu. Vodka Bleu landed his first two starts in bumpers in early 2003 but then took a while to get his act together over hurdles, before scoring twice at Worcester and Newton Abbott in June, 2004. Sent chasing in August, 2004, Vodka Bleu quickly made up into a useful performer up to three miles. He scored by 23 lengths on his fencing debut, over an extended two and a half miles at Huntingdon, and went on to win four more times, including at the 2004 Open in the Jim Brown Memorial Novices’ Chase over the same trip. 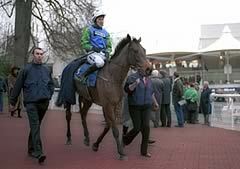 Vodka Bleu defeated Fundamentalist on his last start in a Grade Two novice chase at Newbury over two and a half miles in November, 2004 and has been off the track for the past two years through injury. Vodka Bleu is entered in the Paddy Power Gold Cup at Cheltenham on Saturday. David Pipe explained: “He has a nice low weight and is our number one hope for the Paddy Power, all being well. “He has been off for two years as he banged a tendon and we gave him the time he needed to recover. Owner David Johnson’s retained rider Timmy Murphy will take the mount. David Pipe is having £400 of his £500 charity bet provided by Paddy Power on Vodka Bleu and a £100 reverse forecast with his other intended runner - Tamarinbleu.